Designed as an end of bed TV cabinet to hide the TV when not in use. This bespoke unit has storage drawers in the Left and Right sections. Colour matched to Farrow and Ball shaded white. 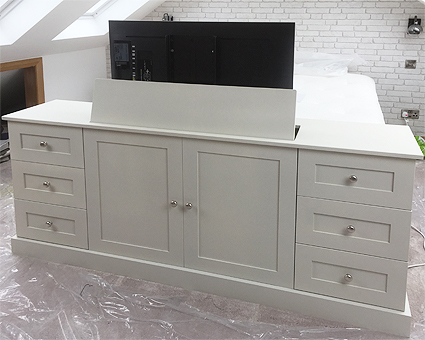 All of our hidden TV cabinets are custom made to measure, to suit your TV size. All sizes of TV can be accommodated. TV lift is controlled by remote and automatically opens and closes the lid.